Trade shows are a great example of people losing track of the goal. Prior to a major trade show, even if I am not attending, I got multiple meeting requests. Very rarely do people try to qualify whether or not it is worth their time meeting. Given that everyone has a limited schedule, they are potentially not only wasting 30 minutes with me but more importantly losing the opportunity to meet with someone who may need their product. Also, make sure you are meeting with the right person. I am also often not the right person they should be meeting with at my company yet people still persist in trying to meet. If the area is one I focus on, not only will I not be able to understand completely the value that you are offering but I also will not be able to convey what our company is looking for. By not qualifying the person you are meeting with, or worse insisting on a meeting with someone who is not involved in your product area, you not only waste your time but set up a bad meeting that could hurt your company’s reputation at the partner company. The corollary to this mistake is not pursuing an opportunity just because the person cannot meet. If you email someone to arrange a trade show meeting and they respond that they are not attending, that should not be the end of the conversation. Just because they are not attending does not mean they do not need your product or service. If you get a response that someone cannot meet at a trade show because they are not going, you should then discuss further your offering and see if it is a fit. The fact that the person even responded to your meeting request suggests there is some underlying opportunity. The point is: Your activity should be centered around building business, that is your goal. Of course it is better to have 50 qualified meetings than 5 qualified meetings but it is better to have 10 qualified meetings than 50 random ones. Overall, though, you need to put in the time and effort to connect with partners and potential partners and determine if there is value to a meeting or call or trade show meet-up. 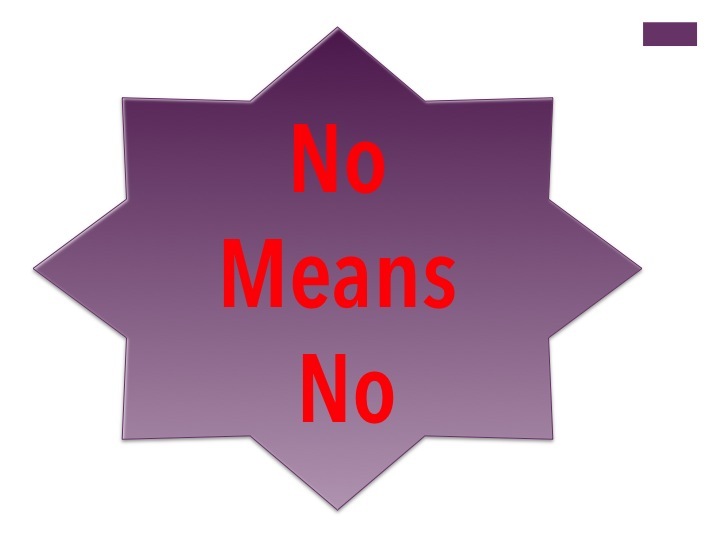 A related rule is that no should mean no. If you asked for a meeting and the person says no, maybe there is no need for your product or they are the wrong person at their company to meet with, accept the no. You are wasting both parties time trying to get that meeting or call when there is no fit. Moreover, you are likely to alienate the other party and they will be less likely to reach out to you when there is a potential opportunity for the fear they will not be able to get rid of you. If you understand your potential partner and have explained how your product (or company or service) can benefit them and there is no interest, once you are sure the potential partner understands what you are offering if they still say no accept it. Be sure to understand why they are saying no (is it lack of budget, internal politics, the value is not significant enough) and follow up in the future based on the objection (for example, if they have six months remaining in a competitor’s contract wait five months and then reach back out). I do want to stress the point I mention above, that more qualified meetings are better than less. There is a sales funnel that applies to everything (from business and corporate development to selling cars), where the more prospects at the top of the funnel the more deals you end up securing. The key is that the prospects at the top of the funnel must be qualified; if you put in garbage, you don’t get more deals, you get more garbage meetings. You should not try to get meetings for meeting’s sake, but only pursue meetings (or calls) when there is a potential business opportunity. Do not waste your time meeting with people who are not the right person at their company for the opportunity. If there is not a fit, or the potential partner just cannot say yes, move on. I enjoyed reading your post. I couldn’t agree with you more about scheduling senseless meetings. This not only is an acceptable business practice in corporate America, but I’ve met some people who actually qualify their day in this manner. “I had 4 meetings today.” No mention of what they accomplished or what was gained, just the number of meetings attended. Thanks for your insight. We have often discussed the problems that salespeople have with “qualifying” their funnels or pipelines. You highlight the issue at the level of prospecting but it is rampant at every level of the sales funnel. This is largely a problem of measuring activity (in this case meetings) versus results (sales). As a salesperson you should take every “No” that you receive as a gift of un-wasted time. Most of the folks that don’t want to qualify a funnel are simply afraid that when you do take a hard look at your funnel it tends to dwindle rapidly. Great Post! I knew you would comment on this one, it was almost Jim-baiting. I do agree totally. The key tale aways are spot on. Recently I’ve been trying to go to meetups and gain potential leads and partnerships. But going to some of them the number one thing in mind is socialization and not really making business connections. So my main goal is not to waste precious time when it comes to building business relationships.